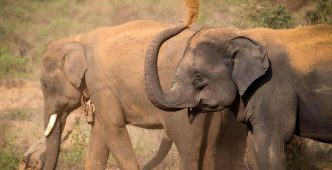 Myanmar (Burma) is home to the second largest total population of Asian elephants remaining worldwide (after India), including a captive population of approximately 5,000, the largest captive population in the world today. Most such captive elephants live in government-owned timber camps where elephant draught power has been utilized extensively for more than a century. Myanmar exports 75% of the world’s teak, and the UN FAO (Food and Agriculture Organisation) estimates that 50-60% of the country’s 60 million people depend on forestry for their basic needs. Despite increasing mechanisation, half of the Myanmar timber is extracted by using trained elephants, particularly in the mountainous areas, because access by vehicles is difficult and such selective logging is more sustainable. 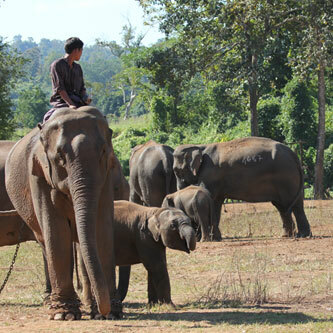 Unfortunately, although at least half of the timber elephants are captive-born, more elephants must be captured from the wild to maintain the workforce. This could result in wild elephants in Myanmar becoming extinct by the end of this century. 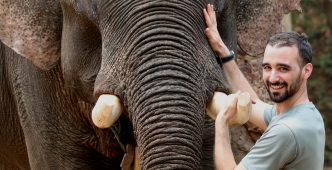 See the “what we do-page” for information on how our research aims to provide new solutions to elephant management and healthcare in order to optimise the balance between working ability, survival and fertility, and to minimise calf deaths. 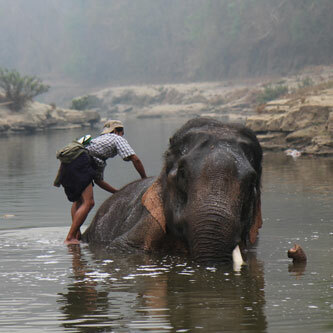 All the elephants involved in our projects work in the timber industry and are owned by the Myanma Timber Enterprise . They are captive, but live very different lives to captive elephants in zoos and their mortality rate is much lower than that of zoo elephants in western countries, more closely matching survival rates documented for wild African elephants. The timber elephants live in forest camps, and are engaged in dragging and pushing logs and extracting timber once trees have been felled, without the need to carve large roads through the forest that jeopardise its integrity. 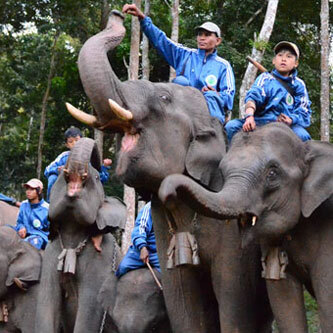 In addition to their oozies (Burmese for ‘head rider’), the timber elephants are cared for by a team of government veterinarians who carry out regular health checks, which are documented in every elephant’s personal logbook, but they are not provisioned for or aided in mating or calving. 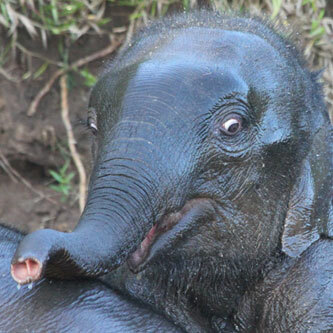 Instead, at night the elephants forage in forests in their family groups unsupervised and encounter tame and wild conspecifics leading to calves often being sired by wild bulls. For this reason, the population is characterised as semi-captive. Elephants have the longest gestation period of any mammal, typically around 22 months. 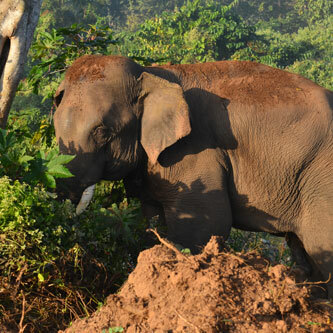 The timber elephants are not aided in mating or calving by their human caretakers, but instead both events usually happen in the forest unsupervised. Many calves are thought to be sired by wild bulls. Pregnant females are given a rest period from mid-pregnancy until 1 year post-birth. Although most calves are born in the forest unsupervised by humans, calves born in captivity are usually detected within a day, their birth date is entered into their maternal logbook, and they are measured and given a health check by an MTE veterinarian soon after birth. Since birth, most calves are taken care of by one or more “aunties” (allomothers) in addition to their mothers. Timber elephant calves up to 4 years of age are known as “calves at heel” and spend their time in relative freedom with their mothers at all times. Mothers are given maternity leave for their first year following birth, and although they are then used for light work, calves are still cared for by their biological and allo-mothers and allowed to feed on demand. Calves are separated from their maternal herd and tamed at around 4-5 years of age. The initial taming takes around 4 weeks, after which each calf is allocated an individual caretaker (‘oozie’) whose relationship with the elephant can last a lifetime. Calves are also individually marked with a permanent ID-number and receive their own logbook detailing every subsequent health check and life event. Calves between ages 5 and 17 are trained and used for light work duties. At 18 years, the trainee elephants are put in the workforce as mature logging elephants. By this age most females are reproductively mature (the average age at first reproduction is around 18). The working season is from June to February, covering the monsoon season and cooler winter months. Working hours per day and year are stipulated by the Government, with usually up to 5 hours per day spent dragging or pushing logs and the rest of the time spent foraging unsupervised in family groups. 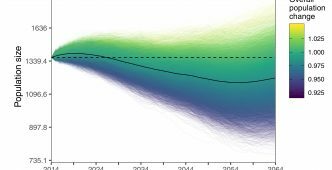 All logging elephants that survive to the age of 55 are immediately retired and allowed to live the rest of their lives (potentially into their late 70s) in relative freedom. However their oozie continues to take care of them and their logbooks detailing health and life-events are maintained until death. Some captive-born females continue bearing calves into their late 60s.